The sight and sound of a volley letting rip is one of the game’s weird little pleasures. Back in 2014 I played Ultimate General: Gettysburg, a short but innovative strategy game set during the Civil War’s most famous battle. Two years later and the same game is back, only now it’s a full singleplayer campaign experience. Ultimate General: Civil War is basically an overblown sequel to the first game, using its success (and everything developers Game-Labs learned) as a foundation to go and build something much bigger and, so far at least, much better. Where Gettysburg was an interesting battle system linked together by a few different events, though, Civil War is looking to recreate the entire conflict, starting you in 1861 and having you fight all the way through to 1865. Given UG’s tactical similarity to the Total War series (unsurprising, since the game’s creator got his start making mods for Creative Assembly’s games) you’d think this kind of scope would also mean the implementation of a similar strategic element, involving the production of units and control of regions of a map. Nope. Instead, this game’s campaign is held together by the persistence of your army, and the control you have over its composition and equipment. The battles with the gold wreaths are the large, multi-stage historical events. The others are “sidequests” which let you pick up extra cash and experience. See, in UG:CW, you’re not in control of an entire side’s war (you can choose to fight as the Union or Confederacy), so you don’t have to worry about production queues or supply lines or research time. You’re just in control of a single army. The only choices you have on when and where to fight are selecting a battle from the map screen above, which will usually have a a few smaller showdowns (basically sidequests) available at any one time, along with a larger, centrepiece historical battle, which like Gettysburg is scripted to take place over several maps and scenarios, some of these taking hours. You will spend a lot of time here messing with your army. Winning battles earns you money and prestige, which is then spent here, the heart of the game’s campaign. Losses suffered in battle need to replenished, which costs cash, and you can also mess with the size and composition of your force, choosing how much infantry vs artillery vs cavalry you want, and how you’ll spread them out. You can even go shopping for different types of rifles and artillery. Which sounds like a lot of tinkering, and it can be tedious—please, let us just enter a value we want for reinforcements instead of making us use a slider—but it’s worth it, because giving the player this amount of control over an army gave me a real sense of ownership. I made this army, I picked out its guns, I named its units, I even appointed its commanding officers. Which makes everything that happens to it more involving than it might have been; I wasn’t sending random little blue specks off to their death, I was sending Walton’s men, the heroes of Shiloh, the guys with the most resolute commanding officer and who I’d just spent a ton of cash on buying fancy new European rifles. 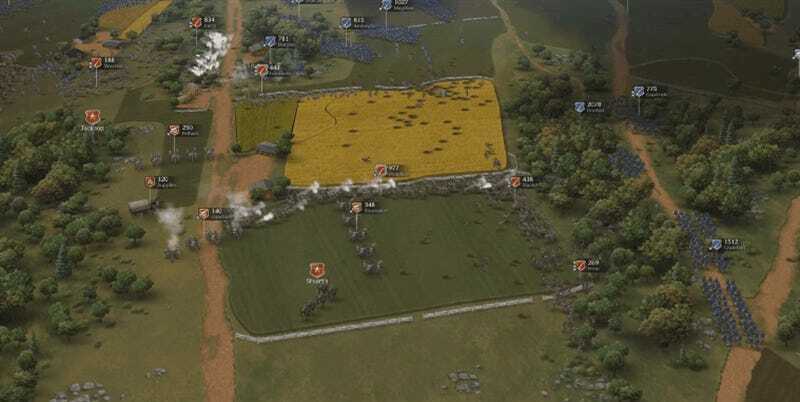 UG:CW’s real-time battles are largely the same as Gettysburg’s, with beautiful hand-drawn maps and the ability to draw precise manouvre commands for your troops. Everything’s just a little more refined, a little more fun; cover and elevation are more clearly defined here, and the ability to designate tasks (like defending a certain point) to whole sections of your army while you focus elsewhere is a welcome solution to the constant map-running these kind of games normally require during big battles. These battles have their problems, like some wonky AI and a camera that doesn’t get close enough to the action, but I still think they’re some of the most enjoyable in real-time strategy gaming. The free-form army control on offer and some elastic rout and withdrawal triggers make battles feel fast and most importantly fluid; battle lines often bend and move, but rarely break, which presents a continual tactical challenge. Seemingly complex flanking moves are pulled off simply by holding the left mouse button and “painting” on the screen. A small team working mostly out of Ukraine was never going to be able to compete with Total War in terms of scope and production value, but the decisions made on where to focus their energies have paid dividends here. Instead of feeling like half a Total War game, missing a vast strategic management and world map control, the flourishes and advances made on the tactical side of things are so good that it’s Creative Assembly who could learn a thing or two here. Before we wind up, you should know that UG:CW is in Early Access at the moment; not all of the campaign is currently playable, and the roster of one-off historical battles isn’t fleshed out either. But in terms of features and stability this plays like a final release, which is why I’ve taken such a detailed look at it here (the full game will be out in early 2017). So long as nothing breaks in the final game, I’m going to be revisiting UG:CW the second its final release is out. I wasn’t even expecting the game’s announcement, let alone how polished it already is, and I definitely wasn’t expecting it to be keeping me from Civ VI in a time of year when I thought I’d be playing Civ VI until Christmas.